Throughout the application, we get so many messages about rolling down changes across multiple records, but SOP seems to be one of those modules where rolling down changes to line items don't seem to be a choice. Take for example Requested Ship Date field. Over and over, I have seem so many newsgroup posts asking for this feature. There are typically two approaches: a) you can create a SQL Server trigger to address the changes when the Requested Ship Date is updated from the SOP document header, or b) you can create a VBA customization that will ask to rolldown the changes, and if the user acknowledges, then run a stored procedure to make these changes happen. I like both approaches, however approach (b) provides ample flexibility and allows for an interactive user experience. In this article, I will address option (a) and will follow up -- in a second article -- with option (b). So let's take a look at our SQL Server trigger first. Let study our trigger for a bit. By using a BEGIN TRAN and checking for errors before committing out transaction, with SQL Server's @@ERROR global variable, we are ensuring that our trigger will work as a single block of code. This is, we are only committing all changes if the updates were all successful. By performing an UPDATE A WITH (ROWLOCK), we are allowing our trigger exclusive access to the rows involved in the update. This will prevent other changes from taking place on these rows while our trigger attempts to change the records. Finally, our DML trigger makes use of the INSERTED special table to account for all header records being modified at once. 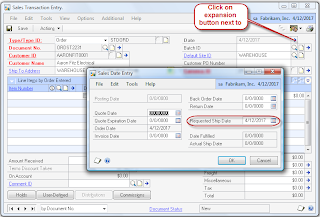 You may say, well sales orders and invoices are updated one at a time in GP. This is true, but if you have an integration that insert records in bulk as part of a transaction, say for example orders coming from a CRM system through a BizTalk orchestration, you may need to address all these orders as one transaction block instead of individually. Also, working with INSERTED prevents the use of SQL Server cursors and allow the use of a set-based approach to our implementation. Please stay tuned for the follow up post! This is a great idea. We have a third-party addon that we purchased that (among other things) provides this functionality. What I'm wondering is if I might use a variant of this trigger to adjust requested ship dates on the SOP10100 and SOP10200 table lines as they are inserted or updated. We have our Dynamics system set to add 2 days to the Requested Ship Date field but the system does not account for weekends. Our order entry team spends all day Thursdays and Fridays manually changing the dates on every line item. I'm thinking to split this into two triggers - one on SOP10100 and one on SOP10200. Can I still make use of the IF UPDATE test and the INSERTED pseudo-table? I still only want to work with any changed (or inserted) records. Thanks for the follow up and your readership. You can certainly do a column test (IF UPDATE(ColumnName)) to perform changes based on your specific requirements. It sounds like you are on track with what you are already doing. All the code on this site is available for your personal use and can be modified to fit your specifics. When I then go into Dynamics and make any changes to the requested ship date on a line item I get a message box saying "A save operation on table SOP_LINE_WORK (45)" and that is all. If I adjust the SQL script to work on SOP10100 I get the same result except the error message references SOP_HDR_WORK. I can't find any references online to this error that seem relevant. Any ideas? I know this an old post but what needs to be change in the Script to only update the requested ship date on the SOP lines items not Purchase Orders, we only want to change SOP not POP. Please let me know how it goes. Cordiales saludos! Hoping you can assist ... I ran your latest update from 8/11/11, in GP2015 however we are receiving the a SOP_HDR_WORK error. Is this trigger not compatible with GP2015? This is a very obvious barrier that I would assume microsoft could fix without having users add sql triggers. As someone else said...when the ship method is changed I'm promted to roll it down to the line items. Why not copy the functionality to other common header/line item fields? I worked through using this and received the same error message that Kerri described. After doing a little research I located your other post on using VB for the same solution. There another user identified that the line IF @@ERROR <> 0 should be IF @@ERROR = 0. After I made this change the trigger began working correctly and did not display the SOP_HDR_WORK error. Thanks for the follow up. Yes, the script issue has been covered before. I really don't know why I haven't fixed it yet. I updated the line and it is working in GP2016.